"Instead of using a sauce on the outside, I'm putting key teriyaki flavorings into the ground meat for these teriyaki burgers. Ideally these burgers should be cooked on a medium-hot charcoal grill, weather permitting." Preheat grill to medium-high heat and lightly oil the grate. Break up ground beef with the tip of a fork in a bowl. Drizzle in the soy sauce, sake, mirin, Worcestershire sauce, and sriracha sauce; crumble in brown sugar. Use tines of a fork to evenly distribute ingredients. Finish mixing with your hands (ideally your hands should be very cold for this). Shape into 4 equal-sized patties. Grill until browned and cooked through turning once, 3 or 4 minutes per side. When burgers develop a slight dome shape and juices begin to come through the top surface, they are done. An instant-read thermometer inserted into the center should read at least 160 degrees F (70 degrees C). 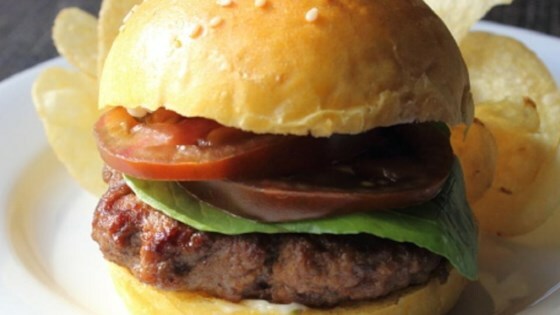 Serve burgers on slider buns with lettuce and tomato slices. A delicious twist on the classic teriyaki burger. These burgers can also be grilled indoors in a grill pan over medium high heat. Pretty good, quick and easy. I also agree with the other reviewer that it needed Pineapple. I added fresh pineapple slices to mine instead of the tomato. was just so so not as I expected at all. This is so super easy to make and so delicious! My son is a picky eater and he asked for second helping.